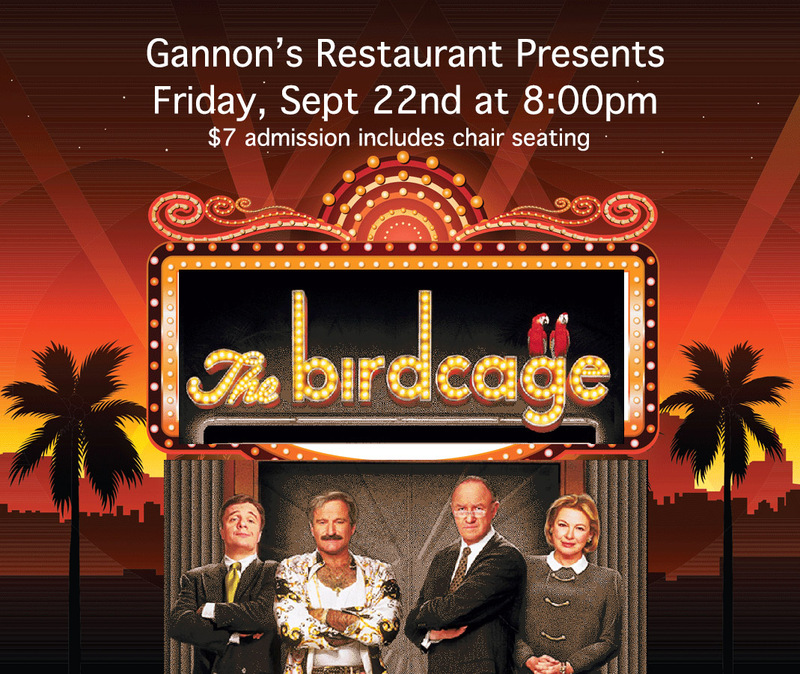 Gannon’s presents Movie Under the Stars: The Birdcage! You voted, and we listened! The Birdcage wins the next Movie Under the Stars poll! 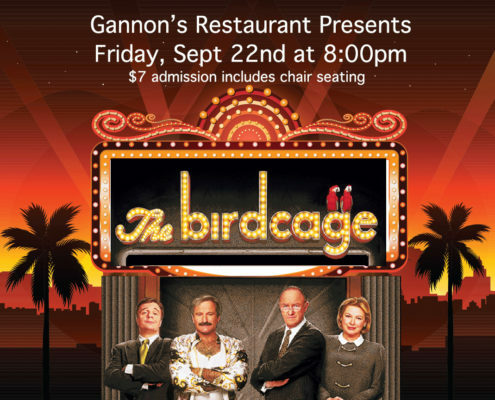 On Friday, September 22nd at 8:00pm, we will show The Birdcage under the stars. Tickets are $7, and includes chair seating. Please join us for Happy Hour in The Red Bar before the show of make your dinner reservations here. 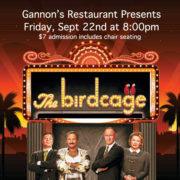 https://gannonsrestaurant.com/wp-content/uploads/2017/09/the-birdcage-at-gannons.jpg 900 1069 Kerri Glover https://gannonsrestaurant.com/wp-content/uploads/2016/06/Gannons-Logo-232x116.jpg Kerri Glover2017-09-11 10:19:552017-09-11 10:21:18Gannon's presents Movie Under the Stars: The Birdcage! 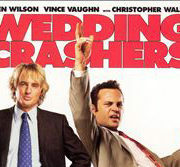 Movie Under the Stars Poll: Which film would you choose? It’s up to you, our Movie Under the Stars Audience! We need your input to decide which movie to select for our next Movie Under the Stars on September 22nd. Please make your selection below and we will screen the winning movie! 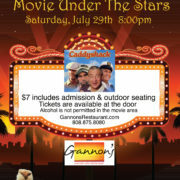 Which movie should Gannon's Restaurant show Under the Stars on September 22nd? 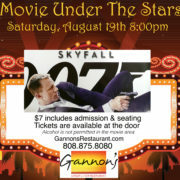 https://gannonsrestaurant.com/wp-content/uploads/2017/08/movieunderthestarspoll.gif 900 1080 Kerri Glover https://gannonsrestaurant.com/wp-content/uploads/2016/06/Gannons-Logo-232x116.jpg Kerri Glover2017-08-28 11:26:232017-08-31 11:24:59Movie Under the Stars Poll: Which film would you choose? 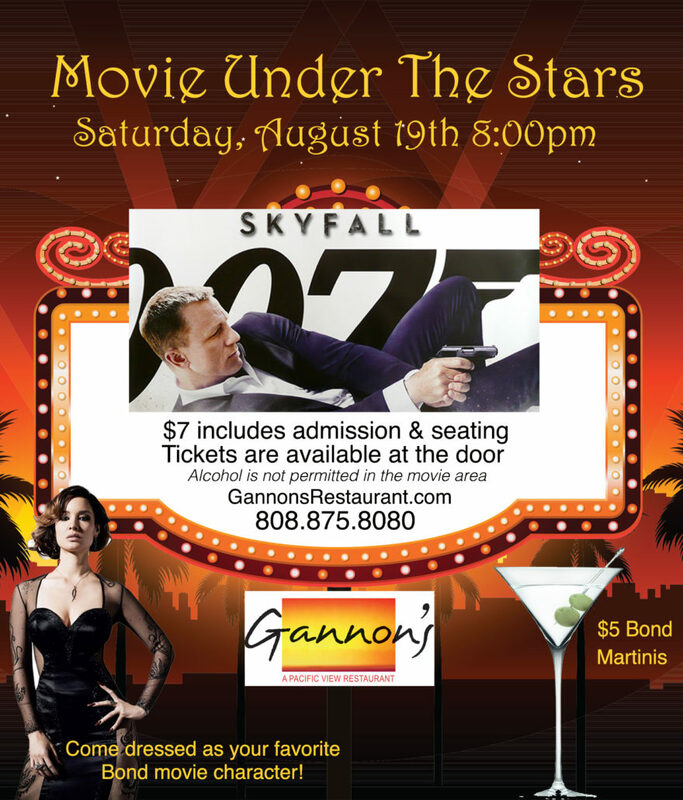 Gannon’s Restaurant Announces it’s next Movie Under the Stars: Skyfall. This James Bond film can be viewed on the lower lawn at Gannon’s Restaurant on Saturday, August 19th at 8:00pm. Guests are invited to dress as their favorite bond character, villan, or bond girl! $5 Bond Martinis will be available at The Red Bar, please join us for Happy Hour from 3:00-8:00pm. $7 Admission includes outdoor chair seating. Tickets are available at the door, and refreshments are also for sale. Gannon’s would love to welcome you for dinner, please make your reservations here. 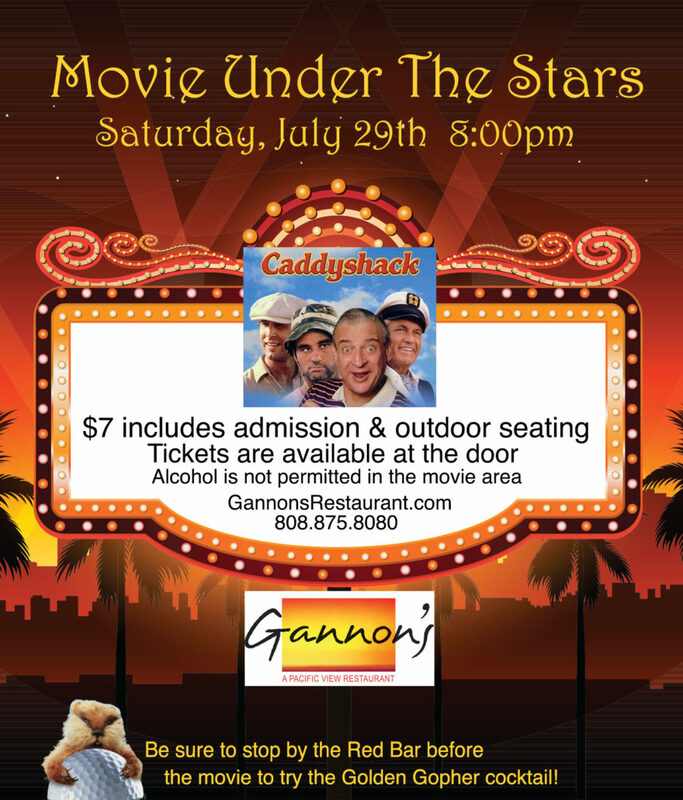 Gannon’s Restaurant in Wailea on Maui announces the first summer Movie Under the Stars as Caddyshack. 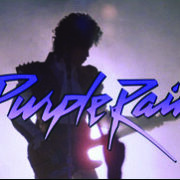 The movie will air on the lower lawn on Saturday, July 29th at 8:00pm. Admission is $7 and includes outdoor chair seating. Alcohol is not permitted in the movie area. The Red Bar will also be serving a specialty cocktail in honor of the movie that evening, “The Golden Gopher”. Come join us for a sunset view dinner and a Movie under the Stars. To make a reservation, please contact Gannon’s at 808-875-8080 or reserve online here.